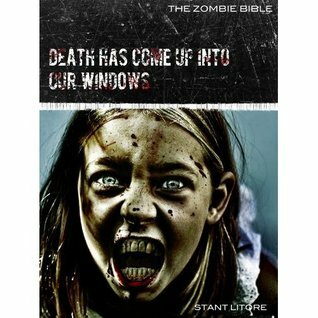 I was lured into reading Zombie Bible: Death Has Come Up Into Our Windows with the tease of Old Testament prophets cage fighting zombies. In reading, I expected a wry, amusing mashup between the Bible and zombies only to find out that I had been pleasantly mislead. This book is as deep as the well the prophet Yirmiyahu (Jeremiah) is tossed into where his captors drop the undead on him in cruel amusement. Really, this book isn't a book about zombies (as some critics will point out), but rather it is a book about love. In between the sparse, yet exciting, zombie slayings, there is a rich, captivating romance. It concerns the love that the prophet has for his wife, his city Jerusalem, and for God. It seems strange to describe a book about zombies as being realistic, but the author gets deep inside the head of the prophet to learn what really fired him up and caused him to risk his life to bring an unpleasant message to a people that did not want to hear it. Yirmiyahu is a one-man Occupy the Temple movement, railing against the ruling and clergy class that had turned its back on the land's poor and mistreated -- and as a result God. In doing so Stant saves the reader from the popular false impression that Biblical prophets were simply predictors of the future, but rather rightly depicts them as the people's conscience crying out against social injustice and warning what the results would be for ungodly behavior. One of many things that impressed me was Stant's command of the Biblical narrative backdrop. He simply didn't drop some zombies into a Biblical setting, sprinkling in some Hebrew words and locations for flavor. Rather he has a rich understanding, not just of the details of the source material, but of the underlying message of love. This is book is intensely spiritual and worthy of meditating on for those inclined that way. There is a poetry at work here whether it is describing the prophet's locking arms with the undead or lips with his wife. Throughout, Stant's prose is delightful and compelling. I look forward to reading more. Sign into Goodreads to see if any of your friends have read Death Has Come Up Into Our Windows.